Are you striving to bake a deliciously creamy cheesecake? Or are you looking for the perfect crusty loaf of sourdough bread? As bakers and bakery owners the question that you really need to ask yourself is “Am I using the right oven for the job?” In this edition of Baker’s Insight we explore the benefits of both Convection and Deck ovens.  As a routine part of the bakery equipment consulting process, the Erika Record Baking Equipment sales team frequently asks clients what type of oven they are using to bake their baked goods. We often find our customers might not be utilizing the right oven for the type of product(s) they are baking. 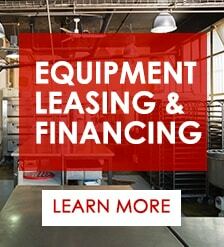 Sometimes this is due to budgetary reasons or simply inherenting equipment from a previous bakery owner. However, this is not the end of the world for most bakeries. Bakers learn to adapt their recipes and baking times to the ovens they are baking with. 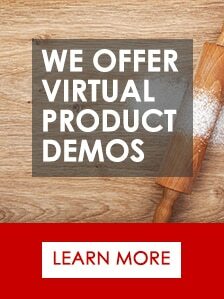 Our goal at Erika Record Baking Equipment is to help bakers and bakeries make their already delicious and fantastic products even better; by aligning them with the right type of oven when making a new purchase. Choosing the right type of oven removes the mystery and experimentation involved with baking those delicious baked goods with a less compatible oven. In this issue of Baker’s Insight we explore the different types of ovens and ways to maximize their use and design. This is a very common and versatile type of oven. The key operating feature of this oven is that heat is transferred through hot air blown from a fan. One advantage of using an oven that uses convection heating is that the products being baked will be heated evenly throughout. Also, you are able to bake products with a great range of temperature. This includes drying meringues at 150 degrees Fahrenheit or baking hamburger buns, dinner rolls, etc. at 425 degrees. Another feature of many convection ovens is the ability to add steam during baking. Adding steam allows rolls to get a nice shine and for breads to fully expand during baking. Within the baking industry, there are many different types of convection ovens being used. These types include: single rack, double rack, 10 pan, rotating rack, and even smaller sizes designed for 1-5 pans. 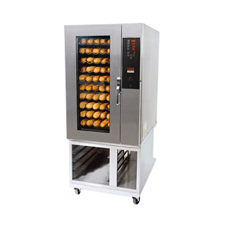 For a majority of bakeries or pastry shops, having a convection oven that allows for versatility and uniform baking is paramount to their success. Typically a centerpiece of any artisan bread bakery, a deck oven is a crucial piece of baking equipment when seeking to attain a beautiful, crusty loaf of bread. 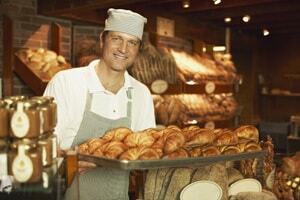 Having a quality deck oven is just as necessary for a bread bakery as a heavy duty spiral mixer. While these ovens tend to take up more real estate in a bakery and require skilled bakers to operate; a deck oven’s ability to produce loaves of hot bread around the clock will leave bread bakers very happy with the results. A distinct difference between deck ovens and convection ovens is the way in which heat is transferred to the product being baked. Deck ovens use conduction heat to bake products. Conduction heating is a process in which heat travels directly from a hot stone or deck, to the loaf of bread or sheet pan being baked. 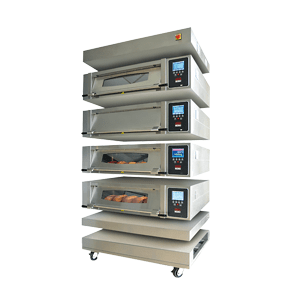 Deck ovens also utilize radiant heat, which is a process that utilizes infrared heat waves to penetrate into the dough, heating it throughout. An important feature of deck ovens is whether it is run by gas or electricity. These two types can be very different. The first notable difference are utility costs. Depending on your region and facility type, it may be cheaper to use electric versus gas and likewise, gas versus electric. Also, with a gas deck oven, you are typically limited to one set temperature for the entire even, even if it has multiple decks. This can cause limitations if you have a variety of products to bake at different temperatures. Meanwhile, with an electric deck oven, you can manually set different temperatures for each deck; which allows for more control, and the ability to bake a variety of different baked goods at once. In addition, when using a gas deck oven, local building codes typically require a hood or a vent to to be used in conjunction with the oven. However, electric deck ovens are typically exempt from this regulation. When used properly, deck ovens are often a bakers best friend. When trying to decide what type of oven is best for your new or existing bakery, be sure to consider what types of products are you planning to bake. In general, a convection oven offers more versatility between the different baked goods that can be prepared. However, if your primary function is baking bread, we strongly recommend that clients consider purchasing a deck oven.